Prizes: Winner of British Book Awards: Newcomer of the Year 2007. Shortlisted for British Book Awards: Book of the Year 2007. 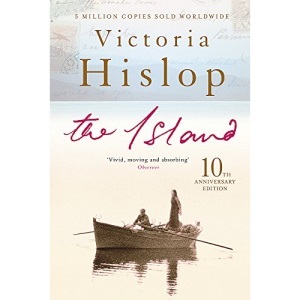 Inspired by a visit to Spinalonga, the abandoned Greek leprosy colony, Victoria Hislop wrote The Island in 2005. It became an international bestseller and a 26-part Greek TV series. She was named Newcomer of the Year at the British Book Awards and is now an ambassador for Lepra. Her affection for the Mediterranean took her to Spain, which inspired her second bestseller The Return, and she returned to Greece to tell the turbulent tale of Thessaloniki in The Thread, shortlisted for a British Book Award and confirming her reputation as an inspirational storyteller. The Sunrise, a Sunday Times Number One bestseller about the Turkish invasion of Cyprus, was published to widespread acclaim in 2014. Victoria Hislop's latest book, Cartes Postales from Greece, is fiction illustrated with photographs. It was a Sunday Times bestseller in hardback and one of the biggest selling books of 2016. By Shirley Mitchell in Paris, France courtesy of AwesomeBooks. My special interest in this book comes from my having lived near a leper colony in Essex in the 1960’s. (No-one ever believes me when I tell them leprosy was still around in the UK at this time.). The theme – this horrific disease – is very well explored. The hideous details, the treatments, the horrors, physical and psychological. Probably one of the best-written scenes is the outlandish and mind-blowing moment of being given the “bad news,” (More empathy here because of my own “You have cancer” moment). The added nightmare for Elena and later her daughter Maria comes with the obligation; in a mere instant, of having to accept immediate and finite banishment to a new, confined life in primitive conditions on Spinoza. Spinoza is the most powerful “character” in the story. Beyond anything I could have imagined, stark and terrifying, grim and forbidding – we follow its development over fifty odd years. We see it affected by Greek politics, by the German invasion of Crete, by the heroic efforts of the patients and the wonderful doctors Lapakis and Kyritis. It is a tough read – but we are urged to continue by the fascinating secret in the Petrakis family and the twists and turns of family history unearthed by the modern protagonist Alexis, on a mission to discover the truth behind her mother Sofia’s reluctance to divulge her past. But Alexis is by no means the heroine of this tale. Maria’s story – her selflessness, her two very different affairs of the heart – is beautifully evoked. This is why I enjoyed the last third of the book most. The firt part was necessary but difficult to follow, with too many abrupt changes of viewpoint. Crammed with characters, there was not enough depth … It was not until I was “let in” to the thoughts and feelings of Maria and Nikolaos that I was able to identify with the emotions of the actors in this Greek trajedy and begin to get to grips with the Cretan personae. As a whodunnit, this book is a good read – I would never have guessed the core truth behind the ancestry of Alexis. Thus I can see why her rather superficial problems have to be presented at such length in the beginning. Plus the fact that starting the story in the very comfortable London home of Sofia points up the primitiveness of the dwellings on Crete and the even more primitive lifestyle on Spinoza.